Paul apparently got tired of waiting for Silas and Timothy to join him in Athens. He moves on alone to Corinth. This is where we pick up his story today. I’m curious why Paul left Athens. Did he receive word that Silas and Timothy were going to be a while? We aren’t told that he was ill-treated in Athens. Did he find the spiritual climate too dark to do much good? We are told that “some men joined him and believed” (verse 34). This doesn’t sound like the harvest they had been experiencing in some of the other towns. I’m sure he didn’t leave them without a shepherd though. The new believers could have been quickly swallowed up by the culture otherwise. The seed with shallow roots. When Paul got to Corinth he started his ministry as usual, in the synagogues. But he didn’t engage in the street evangelism this time. Instead he settled down with a Jewish couple and went to work. 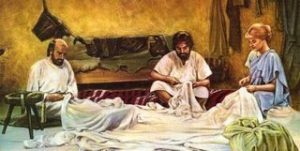 We knew that Paul/Saul was one of the Pharisees but now we learn of his regular trade. The religious leaders were ordinary men who joined together to form the ruling council. They were citizen leaders. Not like the government we sit under where politics IS the career. Paul’s trade was that of tent maker. Paul spent a good many weeks trying to convince the Jews and religious Greeks of the truth. He reasoned with them every Sabbath yet they still didn’t believe. Most of the towns where he spoke people showed interest and conversion within the first or second time Paul spoke with them. Not this group. They were more stubborn and entrenched in their doctrine. It appears that Paul continued trying to persuade them until the time Timothy and Silas showed up. He finally gave up. They were abusive and stiff necked. They could not be reasoned with. So Paul essentially “shook the dust off his feet” as Jesus commanded for a testimony against them. Paul used his robe but it was the same principal. I wonder what was the final straw. Were they getting worse each week or did something big happen when Timothy and Silas showed up? How many of them did receive the truth? We know that the ruler of the synagogue, Crispus, believed, along with his whole household. When we are told that “many of the Corinthians hearing Paul believed and were baptized” (verse 8), were they from the synagogue or from the house next door? I’m betting it was from the Gentile outreach, not the Jewish one. Either way, there was a large harvest of souls in Corinth. Here is the part that I bet Paul liked. Paul has been running from city to city, just ahead of the angry mobs. He hasn’t been able to stay in one place for very long. His life was always in danger. But God changed that in this city. God told him that he would be safe in Corinth. God had many people He wanted to reach and that took time. He protected Paul so he stayed for a year and a half. I’m assuming he worked as a tent maker during that whole time too. The Jews weren’t done opposing Paul even after he left the synagogue. He was cutting into their business. People were turning to Jesus instead of Judaism. They tried to get Paul in trouble but it didn’t work. God was still looking after him. The official they were seeking help from refused to even get involved. Too bad Pilate wasn’t that brave. But then again we know that everything that happened was part of God’s plan. Father God thank You for protecting Paul and for sending him some special friends. Thank You that You do the same for me. You put just the right people in my life to help me through my tough times. Sometimes those people are only there for a season but they are always there for a reason. Thank You for the ones that last a lifetime too. I really wish I had a few more of those. I guess moving so many times makes it a bit more difficult in that category. Thank You for my family! They are always there for me in one way or another. My family are my friends for life! My spiritual family also, just like Paul’s.